Md-ACS1 gene is selected as one of RosBREED’s “Jewels in the Genome,” because knowledge of this gene leads to more efficient breeding of firm, juicy, crisp-fleshed apples. Md-ACS1 (Malus domestica 1-aminocyclopropane-1-carboxylic acid synthase) is a gene that influences apple texture (Harada et al. 2000). 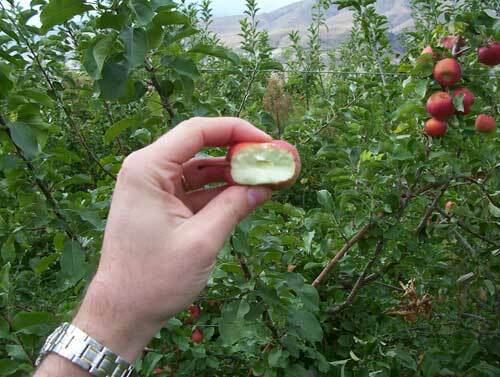 Apple texture is a critical eating quality trait. 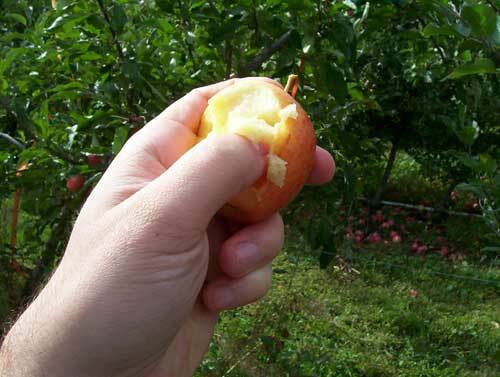 Firm, juicy, crisp-fleshed apples are more desirable than those with soft mealy flesh. There are two natural variants of the Md-ACS1 gene (Zhu and Barritt 2008). One is involved in normal production of the ripening hormone, ethylene, resulting in softer fruit before and after storage. The other variant is associated with much lower production of ethylene, thereby allowing fruit to maintain excellent texture for longer periods. A DNA marker flagging the Md-ACS1 gene helps identify which variant is present in any apple plant. Using this marker, apple breeders can determine which variant each potential parent carries and design crosses to yield a large proportion of seedlings with lower ethylene production and firm fruit. Additionally, offspring carrying the undesirable variant can be weeded out early to avoid growing trees that will eventually bear soft mealy fruit. Figure 1. Soft apple. Photo credit: Cameron Peace, Washington State University. Figure 2. Squishy apple. Photo credit: Cameron Peace, Washington State University. Harada T., Sunako T., Wakasa Y., Soejima J., Satoh T. and M. Niizeki. 2000. An allele of 1-aminocyclopropane-1-carboxylate synthase gene (Md-ACS1) accounts for the low ethylene production in climacteric fruits of some apple cultivars. Theoretical and Applied Genetics 101: 742-746. Zhu Y. and B.H. Barritt. 2008. Md-ACS1 and Md-ACO1 genotyping of apple (Malus x domestica Borkh.) breeding parents and suitability for marker-assisted selection. Tree Genetics and Genomes 4: 555-562.